D'Lo Water Park has been set up for a lot of family fun. There's activities for all ages all year long. Here is an outline of what is available at D'Lo to help you plan your next vist. One furnished cabin that is located on the Strong River. With the beautiful scenic view of the river and secluded enough to enjoy the privacy of a family vacation. Check the Calendar for available dates. There is an area designated for camping in tents which is also situated on or near the Strong River. Depending on your preference, you can either be near enough to wake up and look out at the river or you can have some distance. With 24 camper pads, all equiped with water, sewer, and electric (30/40/50 amp), the luxury of camping in your own camper is right at your finger tips. For a family environment and enjoyable tranquility of the wilderness, this is a good option if you are traveling in style. D'Lo Water Park is a prime spot for going canoeing, kayaking, and tubing down the Strong River. There is a river gauge available so you can check the water level in the river. Enjoy the peace and beauty of the Strong River and relax while you catch a few fish. Great family fun. There are two different playgrounds for the kids. However, if you are considering a family vacation, D'Lo Water Park could be considered a playground for the whole family. We have three ball fields that are available for practice, tournaments, or family fun. A concession stand is available. Inquire at the D'Lo Water Park Office. 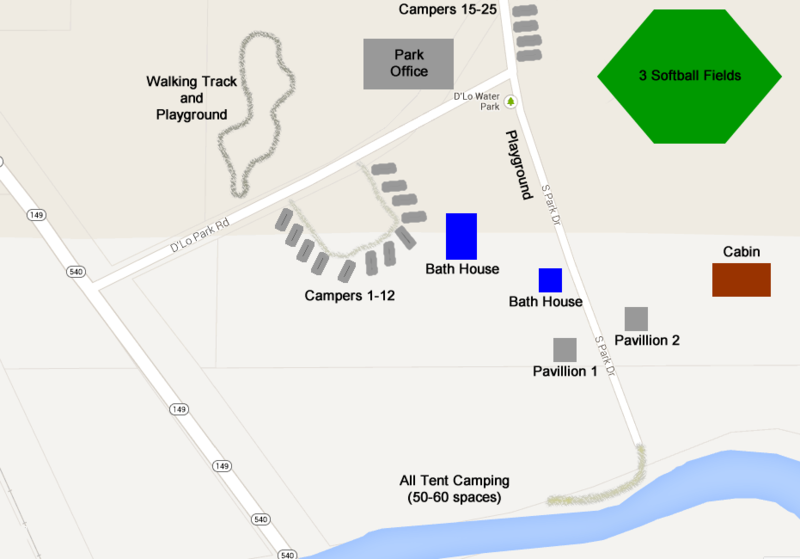 There are two pavillions available for family reunions, gatherings, or just general events where you can get together and enjoy a day at the park. A walking trail is available for those who enjoy a little time on their feet. After a long day at the park and a good nights sleep, wake up and head out to the walking trail to get a jump start on the morning. Walking the trail anytime is very peaceful and enjoyable. There is a bait shop and store located in the D'Lo Water Park Office that has a small variety of snacks, drinks, ice, fishing tackle, and bait (minnows, crickets, etc...). If there's something you need, this is the first place you should start looking. How do you find D'Lo Water Park? Maybe this will help. 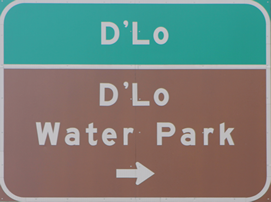 Watch for the D'Lo Water Park sign that tells you to turn right. 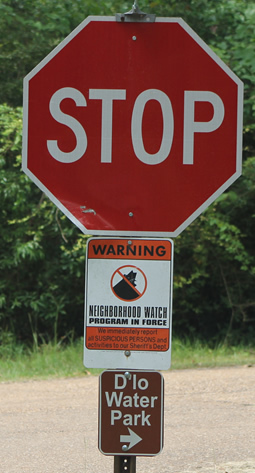 Once you turn right, follow the small "D'Lo Water Park signs that are attached to the "Stop" signs. Take the Prentiss / Pinola Hwy 13 exit in Mendenhall, MS. Follow the signs to the "Hospital" by turning right onto Hwy 149/540. Continue past the hospital and you will find D'Lo Water Park on the right in approximately 1.2 miles.